DOUBLE. CREATURE. FEATURE. There are three things that just scream “Halloweentime”: 1: pumpkin carving, 2: candy corn (even if you think it’s nasty), and 3: scary movie nights. And when we looked at the winning designs of our Villains challenge & Horror Movie Poster challenge back to back, we felt like we were transported to a drive-in movie theater in the ’80s for a double feature horror movie night. The artist behind the Horror Movie Poster design – Khairul Anam (@aanmyers) – created a purrfect B-movie worthy horror poster, while the Villains winner – Ren Valenzuela (@renvillainzilla) – created a design that tapped right into our Masters of the Universe-esque nostalgia. How could we NOT feature them back to back?? First things first, congratulations! What’s something you’re super excited about in life currently? Khairul: Fantastic Beasts 2. I was very interested in Fantastic Beasts 2. I repeatedly watched the newest trailer. Many hidden messages are displayed in the trailer, and it can answer the theories that developed among fans. “Unlimited Powah” by Ren Valenzuela in ACTION. Congrats on your first print! Does it feel “unlimited powah” levels of awesome? Ren: Absolutely! I didn’t expect my first ever submitted design would be my first print too! Beginner’s luck! “The Grim Reapurr” by Khairul Anam also in action! Ren: I was born in the late ‘80s and grew up watching ‘80s-90’s cartoons, video games, TV shows, movies, comics, all the pop culture stuff at that time. I really like those science fantasy and horror genres back then and I carried those inspirations to this day; albeit it turned a bit more mature and cynical. Regarding the design, the villain’s look is just a mashed up stereotype of villains I can think of: Skull + Vampire + High-collared Evil Wizard Cape then a science fantasy twist – a Power Glove! Viola! These two dastardly designs in action. 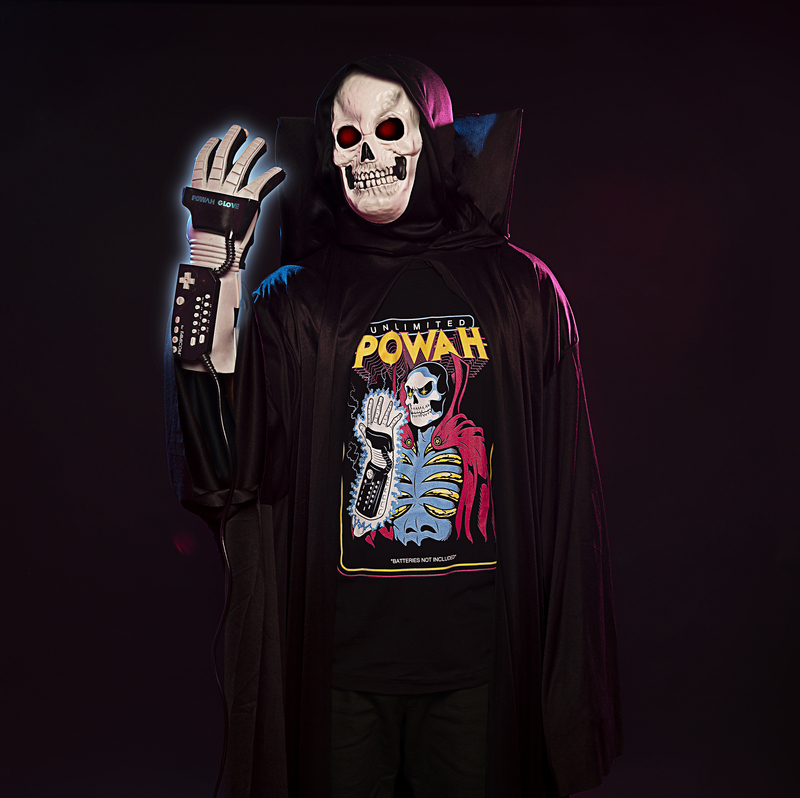 Top row: “Unlimited Powah” on a men’s extra soft tee & an iPhone case and “The Grim Reapurr” on a notebook. 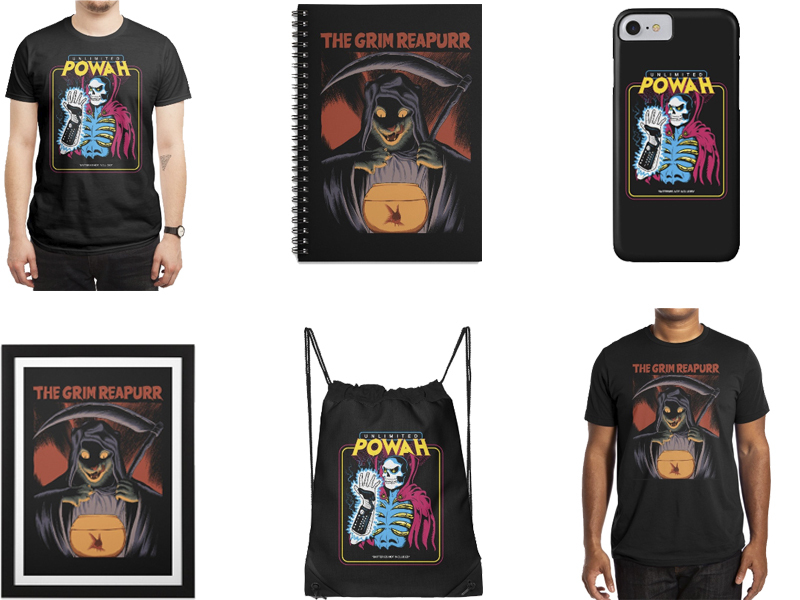 | Bottom row: “The Grim Reapurr” on a framed art print & extra soft tee, and “Unlimited Powah” on a drawstring bag. Khairul: The inspiration came when I saw a Threadless inspiration board for the Horror Movie Poster Challenge. When I opened the inspiration board I saw the poster of the Eyeball movie; the robed character reminded me of The Grim Reaper. I am challenged to make The Grim Reaper characters funny because they are always identified with spooky characters. 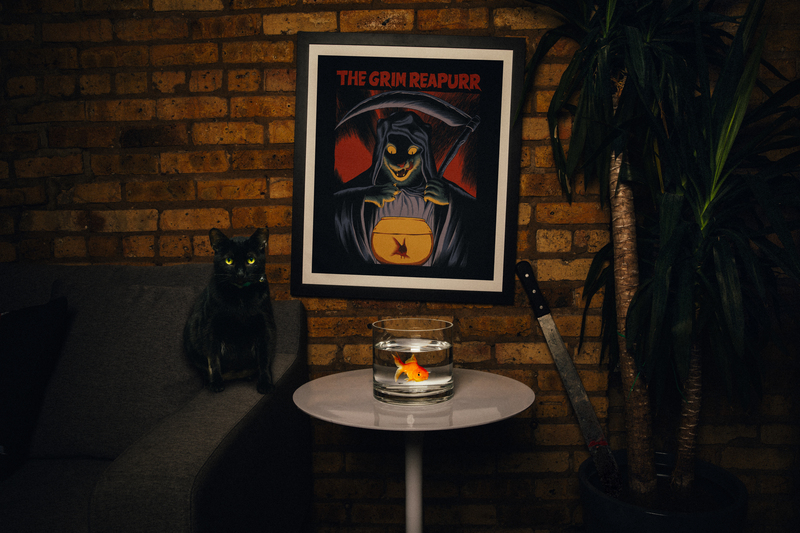 I used a cat to make The Grim Reaper character funny because they are inspired by the words “The Grim Reaper”. I immediately thought of replacing them into “The Grim Reapurr”. Just like when I did it in my The Return of Vampurr design. 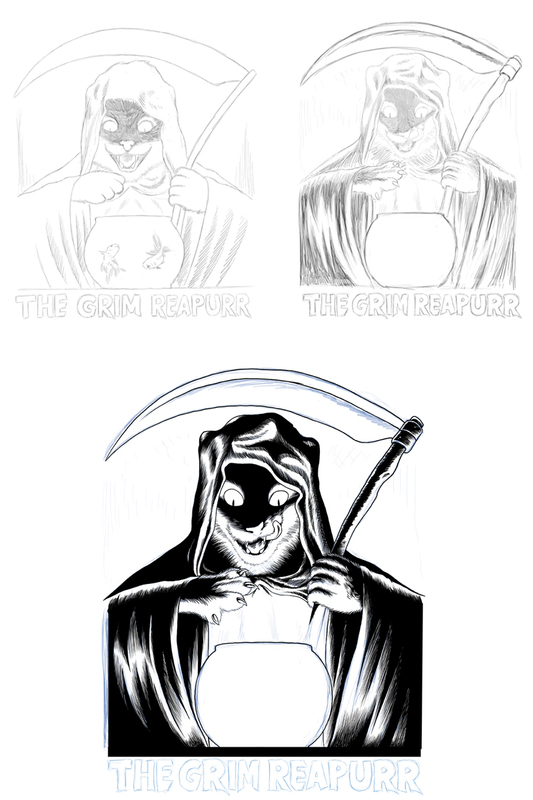 WIP for “The Grim Reapurr“. Khairul, were there any movie poster styles you were inspired by? Khairul: Francesco Francavilla. I was inspired by his works. I really like the style and color he uses. Ren, what are some of your favorite villains? Ren: As a kid, I was kinda biased with the villains in terms of their looks/design. I found MCs boring most of the time. Sometimes I found myself cheering for the villains! xD I have many favorites because of that, but if I have a top three, it would be Skeletor, Dracula (Castlevania), and of course Darth Vader! 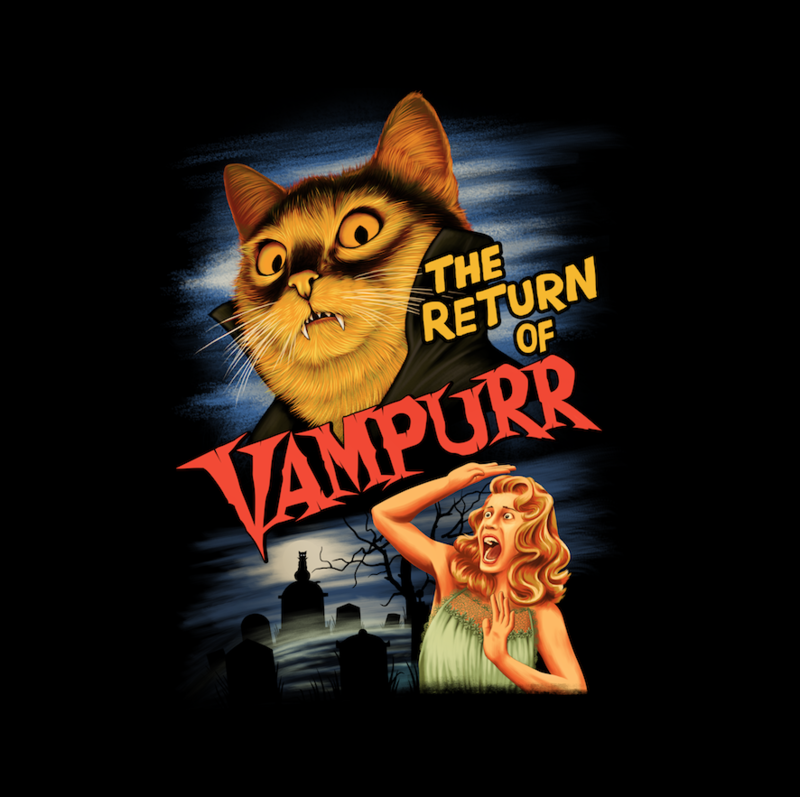 “The Return of the Vampurr” by Khairul Anam. Khairul, what are your top 3 favorite horror movies (or stories) or all time? Ren: I always go with pen and paper for my initial drawings. Reason is, I feel connected with my work somehow if I do it that way. 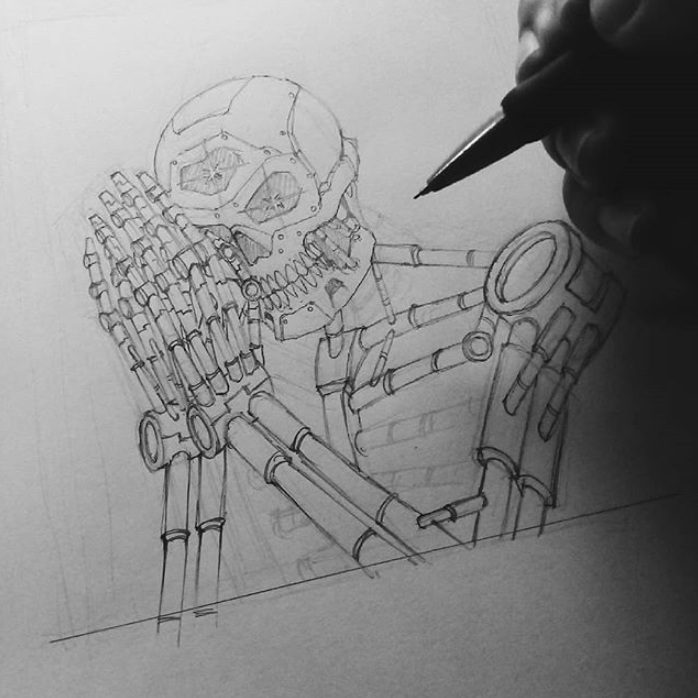 Another reason is I don’t want to get rusty with my traditional skills. Analog is still the way to go for me! I go digital after I’ve laid out and finalized everything, though. 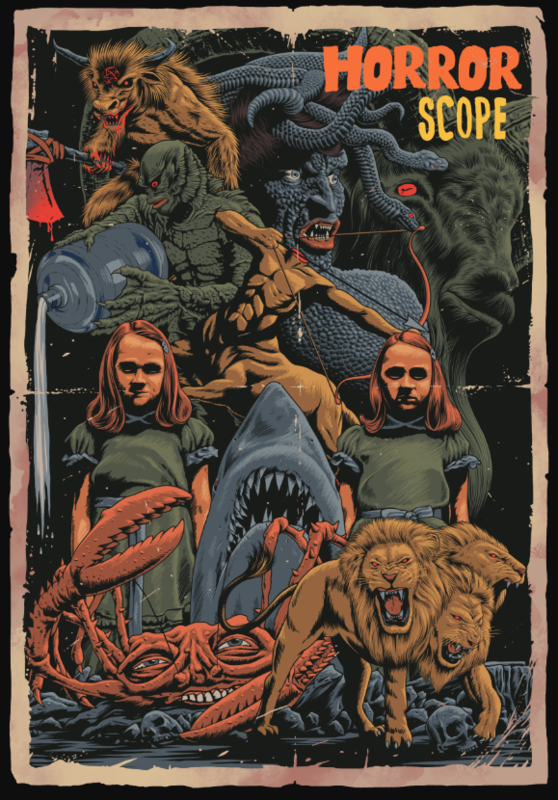 “Horrorscope” by Khairul Anam and Dina Prasetyawan. Ren: Nothing in particular really, but I came across this “Imitation, Assimilation, Innovation” by Clark Terry. It’s about learning jazz music but I find it applicable to other things too! Go search it up online if you have a spare time. Khairul: Look around you, because inspiration can come from anywhere. Inspiration can come from something you don’t expect, even inspiration can come from something you don’t like. Be open to all things; do not immediately reject something that is not suitable for you, because it could be useful for you in the present or in the future. “Eternal Summer” from Ren Valenzuela’s Artist Shop. Ren: Big thanks to Threadless and the community for picking my design! Have a nice day everyone! Cheers! Khairul: Thank you for all the people who gave their scores and comments on my submission. Posted in Artists Speak, Behind The Tees and tagged '80s, best villains, cat design, cats, creepy, eighties, grim reaper, Halloween, horror, jack o lantern, masters of the universe, pumpkin, scary designs, spooky, villains. Bookmark the permalink.